Manmade sulfur dioxide emissions by country show a decline by the historically large emitters - Europe and the US - but increases in growing economies up to 2005. COLLEGE PARK, Md. — A new analysis of sulfur emissions appearing in the journal Atmospheric Chemistry and Physics shows that after declining for a decade, worldwide emissions rose again in 2000 due largely to international shipping and a growing Chinese economy. An accurate read on sulfur emissions will help researchers predict future changes in climate and determine present day effects on the atmosphere, health and the environment. "Sulfur dioxide is an important component of the atmosphere. It changes the radiative balance of the earth by influencing the amount of the sun's energy that warms the globe. 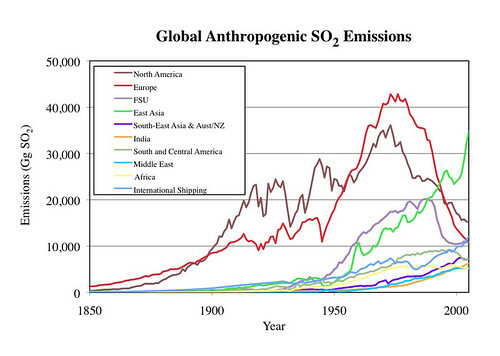 We need to understand how much sulfur dioxide is emitted, and when and where it is emitted. This study will help us do that," said lead author Steven Smith of the Joint Global Change Research Institute in College Park, Md., a collaboration between the Department of Energy's Pacific Northwest National Laboratory in Richland, Wash., and the University of Maryland. Unlike similar studies, the new analysis also provides an estimate of how accurate this study's emissions tally is. Referred to as "uncertainty," the accuracy estimate arises from difficulties inherent in tracking sulfur. This study estimates that actual emissions for recent decades lie within 10 percent of the average global emissions reported by Smith and his colleagues. Regional values could potentially be off by a much higher degree — up to 30 percent in China, for example. "The regional uncertainty can be moderately high, but the global numbers are much more accurate," Smith said. "Understanding the uncertainty will help us determine how sensitive the earth's atmosphere and land are to changes in sulfur content." The Industrial Age ushered in widespread combustion activities that spew sulfur into the atmosphere. Sulfur dioxide has the potential to acidify rain, soil and lakes, and it can counteract some of the warming effect of carbon dioxide, making it an important component of the environment to understand. Sulfur's climate role is complicated. In the air, it can form tiny particles called aerosols, creating new ones or building up old ones. Aerosol particles help form cloud drops, potentially changing rainfall amounts as well as affecting the acidity of the raindrops. Both clouds and the aerosols themselves reflect sunlight, reducing the amount of energy absorbed by the planet. To determine how much sulfur has been emitted between the approximate beginning of the Industrial Age, 1850, and 2005, Smith and colleagues analyzed data about sulfur-emitting activities such as coal burning, copper smelting, or the use of petroleum. The data came from more than 140 countries and went back as far as the 1800s, when publications even at that time tallied how much coal and copper were produced. The team collected the datasets, evaluated the quality of the records and plotted the data over time, breaking them down by region, source — such as coal or oil burning — and economic use such as heating or cooking, power production, and others. The team estimated emissions data both by calculating sulfur release based on how much was contained in sources as well as from actual data on emissions collected from modern power plants. In the United States, government agencies such as the Environmental Protection Agency and the Department of Energy collect such data. The factors that determine total emissions are the amount of fuel consumed, its sulfur content, and any pollution controls employed. The team found that manmade sources of sulfur emissions eclipsed natural sources by 1870, two decades after the start date of this analysis. By the year 2000, however, refineries were removing half the sulfur from crude oil, reducing emissions, the researchers estimated. Since 1980, the fraction of sulfur coming from petroleum — 50 percent — and coal — 30 percent — has remained constant. In a reflection of desires for cleaner fuels, emissions as a fraction of fuel consumption began decreasing around 1970, due to shifting to lower sulfur fuel sources, different end uses, and emissions controls. Total global emissions rose dramatically from 1850 to the 1960s, plateaued and then decreased after 1990, and then started rising again in 2000. Although the contribution from major emitters of the past — North America and Europe — has been declining since the 1970s, sulfur emissions are rising in much of the rest of the world. Especially noteworthy is China with its phenomenal growth. By 2005, China's share of sulfur emissions came in at 28 percent of the global total, up from about 2 percent in 1950. The international shipping industry generally uses a lower quality, higher sulfur content fuel than other transportation modes, and emissions from this activity have been growing in importance. They now constitute 10 percent of the global total. Although rising during the study's time frame, a recent international agreement referred to as MARPOL promises to dramatically reduce these emissions in future years. "Emissions from international shipping have not gone unnoticed," said Smith. Although there is no central repository or process to keep this kind of information up-to-date, Smith reports that this data is being used by other researchers from climate modelers to social scientists. An earlier version of the data has already been used in models that are exploring possible futures of global climate, results that will be used in the next assessment by the Intergovernmental Panel on Climate Change (IPCC). In addition, Smith is curious to see recent emissions data from China, the largest sulfur emitter in the world. "The most recent numbers in this study are from 2005, six years ago," said Smith. "Since this data was collected, China's emissions-control efforts have gotten much stronger. In China, the government is well aware of the impacts of sulfur emissions on health and ecosystems, and they've started to control them." Reference: S. J. Smith, J. van Aardenne, Z. Klimont, R. J. Andres, A. Volke, S. Delgado Arias, Anthropogenic Sulfur Dioxide Emissions: 1850-2005, Atmospheric Chemistry and Physics, February 9, 2011, DOI 10.5194/acp-11-1101-2011. This work was supported by the US Department of Energy's Office of Science. The Joint Global Change Research Institute is a unique partnership formed in 2001 between the Department of Energy's Pacific Northwest National Laboratory and the University of Maryland. The PNNL staff associated with the center are world renowned for expertise in energy conservation and understanding of the interactions between climate, energy production and use, economic activity and the environment.